Another name for the particular seasnake is Hardwick's seasnake. One very interesting fact (now hold on) is that this snake is extremely venomous and that there is no anti-venom available as of this writing. It is a scary fact. There isn't much to be said about the color of this particular creature. The color of the sea snake from the middle is olive-grey and then darkens to the top. The lower half is creamish-yellow. The skin has scaly patterns when correctly processed, which of course gives it a beautiful grain. 1.5 meters long (4.92 feet). Maximum weight unknown. 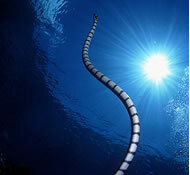 The maximum age of Hardwick's sea snake is not known. Australia's Tropical north, ranging from Brisbane in Queensland, right around the coast to Broome in Western Australia. Found throughout the Indo-Chinese Sea. There are no snake cultures for this particular snake. One expert has determined that water snakes in general are difficult to raise in captivity. Hardwick's sea snake are only caught in the sea. By the way, herpetologists are experts that study reptiles and amphibians, including snakes. Yes. Fangs (3.3mm long) delivers a double dose of neuro-toxins lethal to humans. It's like getting killed twice over! Like all snakes, they avoid humans. Sorry, we do not have official records about injuries related to Hardwick's sea snake. But with that kind of poison, it's very remarkable that one would survive to tell the tale. It is known that Thais eat cobras. We could not find any information available about this particular snake being eaten. Sorry, no information available. Despite their venomous nature, the sea eagles catch these snakes directly from the sea and eat them. A pity, we do not know how it tastes like. They live near coral reefs, estuaries. They reproduce annually, females being sexually mature by 2 years. They give birth to 3 offspring at one time and these are born live (viviparous). 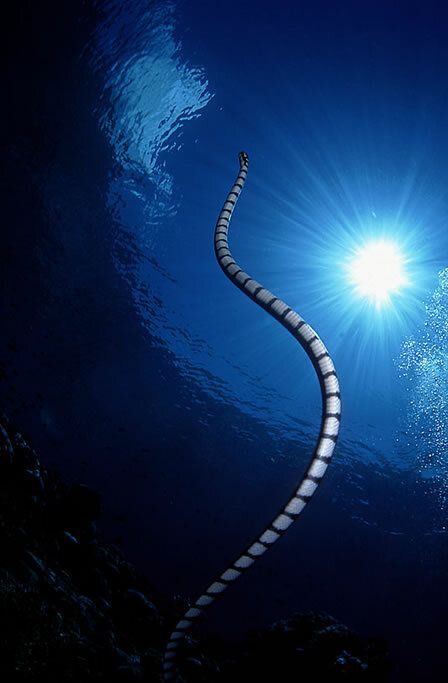 Sea snakes eat mostly fish but may also include squid and cuttlefish. None. Caught in the wild. Very little is known as reported catches are accidental. Fishermen find these sea snakes in their nets with the daily catch. The skin is removed from the snake. If there are remaing flesh fragments in the inner side of the skin, these should be removed as well, then dried. Then the skin has to be "relaxed" after it has dried, has to be made flexible. It is rinsed and placed in a pickle solution (venigar, water and salt). The tanning process is straightforward. 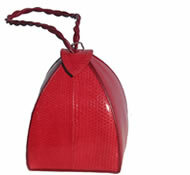 The snakeskin is rinsed and the excess water is removed by squeezing the snakeskin. The snakeskins are placed into a tanning solution. Depending on the tanning agents used and the accompanying instructions, a certain Ph level should be maintained. The snakeskins are left in the tanning solution for about 12-20 hours. It is then removed from the solution, rinsed and drained. The snakeskin is now ready to be descaled and oiled. After it is tanned, the scales are then removed. Then it is oiled using hot water and an oiling component solution. The oiling solution is rubbed into the snakeskin. After that, the snake skin goes through a finishing process. It is tacked out flat on a board and the oiling solution is allowed to soak into the flesh and then dried. When the snakeskin is almost dry the skin is worked on gently to soften it. Then it is sanded to have a smooth finish. 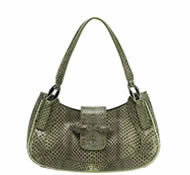 The leather has a beautiful grain, a result from the scaly patterns of the sea snake.